Sciblogs | The robot – can it help out at Pike River? The robot – can it help out at Pike River? UPDATED: This evening’s press conference on the rescue effort underway at the Pike River mine had much discussion of the military robot that is being prepared for deployment into the mine entrance. Tasman District police area commander Superintendent Gary Knowles said the robot being supplied by the military would progress up the entrance of the mine and carry four video cameras. It could also carry sensors for detecting gas. Is it a robot specially designed for mining rescue missions? No, it isn’t. But there also isn’t such a device in deployment anywhere. He added that the robot, which is a multi-use device used for everything from bomb disposal to traversing disaster zones, could only be deployed in fresh air, because it is not “intrinsically safe”. That means it is not designed from the ground up to prevent electronic charges or sparks that could trigger an explosion in the presence of certain mixtures of gas. It has 1000 metres of fibre optic cable which it will trail behind it, sending video back to the outside world and allowing its controllers to steer it. Knowles said it would carry in its mechanical hand a rag or piece of paper as a visual aid to gauge if there is airflow in parts of the shaft it can reach. The limit in the length of the existing cable available for the robot and its battery life will limit the extent to which the robot can explore the mine – though the cable is apparently being extended up to 2.5km to reach the full length of the shaft. It will also have to manoeuvre its way around a large mining vehicle abandoned in the middle of the shaft. The robot’s military handlers are apparently completing a risk assessment to make sure introducing the robot to the mine isn’t likely to trigger an explosion. But that prompted an interesting question from one of the journalists attending the press conference – if the robot will only be deployed in fresh-air scenarios, why not just send a person down? Pike River’s Peter Whittall suggested its a matter of relative risk – sending a robot down is risky, but sending a person down is even riskier, given the increased potential for loss of life if something goes wrong. V2 is approximately 50 inches tall and weighs over 1200 pounds. It is propelled by explosion-proof motors that drive rubber tracks similar to a military tank. It is equipped with navigation and surveillance cameras, lighting, atmospheric detectors, night vision capability, two way voice communication, and a manipulator arm. The manufacturer is Remotec, Inc. of Oak Ridge, TN, a world leader in hazardous duty robotic vehicles. 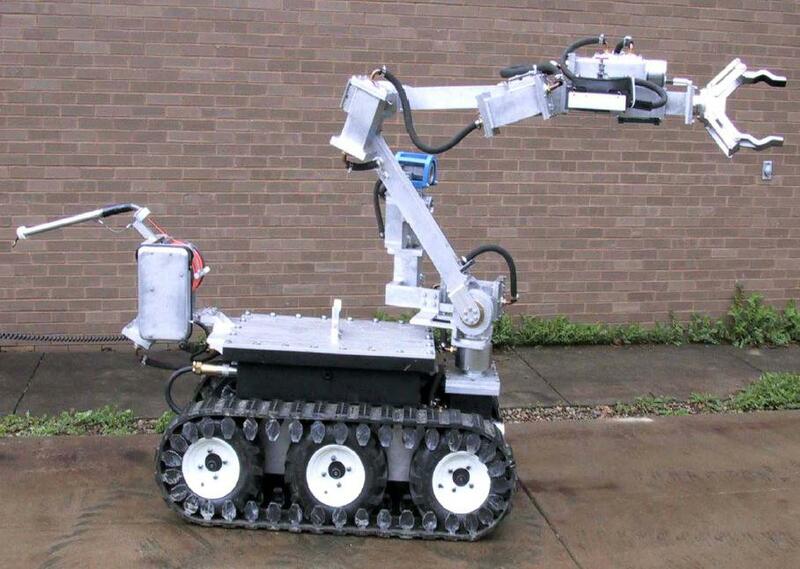 Remotec has designed and developed robots for applications such as bomb squads, hazmat, military, swat team, remote inspection of nuclear facilities, etc. MSHA acquired the specially designed robot at a cost of $265,000. Unable to provide the rescuers with much information, the robot was left down the borehole overnight. Unfortunately, when the crew returned to retrieve it the next morning they discovered that the hole had shifted and the robot could no longer make its way back to the surface. Despite several attempts to remove the robot, including using a 400-pound chisel to break up the ground blocking its escape, the $35,000 robot became permanently trapped 52 feet below the surface. The above description appears to actually be based on the report Mobile Robots in Mine Rescue and Recovery by Professor Robin Murphy et al. Professor Murphy runs the Centre for Robot-assisted Search and Rescue at Texas A&M University , and is a world-leading expert on the deployment of mobile robots in disaster zones including mines. She is quoted in the Science Media Centre update above. ’Robots in general in the past have seldom worked — they are not able to cope with the level of damage found in the mines and are not flame proof or intrinsically safe. A robot was used in the USA at Sago with limited success. Still, several experts are confident robots have a useful role to play in mine disasters with further refinement. William L. “Red” Whittaker is director of the Field Robotics Center and founder of the National Robotics Engineering Center at Carnegie Mellon University in Pittsburgh. In this interview, he expresses optimism that robots are close to proving their worth in challenging mine search and rescue operations. In a mine there are corridors and intersections and walls and floors and a roof — for a robot’s navigation and reasoning that’s a lot of information. But it’s still a lot different than sending a robot into rush-hour traffic, for instance, to head two miles across town. A mine is a relatively simple world for a robot because it is uncluttered by many unanticipated items. In an office building there is far more complexity and clutter — desks, water coolers, signs, and people. So a mine is an amenable environment for a robotic device designed for simple navigation. There is no fundamental barrier to good locomotion or moving through mine conditions or getting command and control via that robot or appending sense detectors or illumination devices or scanners. So useful rescue response robots could be specialized and deployed in the near term — there’s no leap of physics or big missing piece of technology for machines that could move quickly and effectively in mines. Other technology that would aid search and rescue teams in the event of mining disasters is also being developed. RFID tags could be carried by miners, transmitting data continuously about their location. But the range of these tags are limited. Inertial portable navigation systems and underground GPS devices are in development to get around the limitations of RFID. Given the patchy track record of robotic devices in aiding in mine search and rescue operations, its important not to invest too much hope in what the New Zealand military’s robot could achieve. Still, robotics experts will likely be watching with interest as the robot is deployed as each mining incident gives them valuable information about the limitations and potential of the technology. any progress on mine rescue robots since 3 years passed?